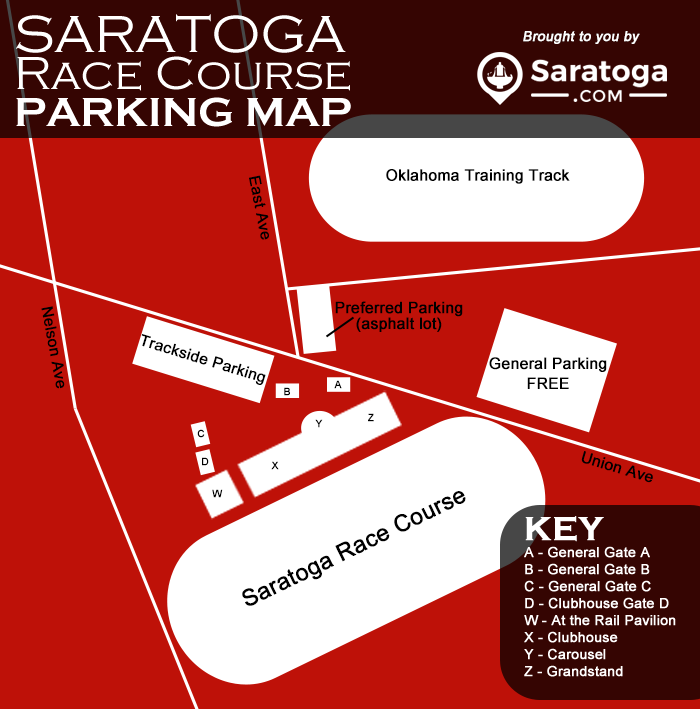 Wondering about Saratoga Race Track parking? As you drive nearer and nearer to the Saratoga Race Track, you will see many parking signs all over the place as there are a variety of places to park near the track. Keep in mind, it's very difficult to find a good parking spot at the Saratoga Race Track unless you show up really, really early, so plan to have a lengthy walk to the gate. Tip 1: As a general rule, the closer to the track you get, the more you will pay for parking. Tip 2: If you see a spot, grab it. The Saratoga Race Track is not the place to go hunting for a better spot. Tip 3: Expect to spend a long time in traffic before reaching the track as traffic usually gets very congested. Tip 4: Watch out for pedestrians, small children and pets when parking at the Race Track. If you have little ones, a stroller is a good idea. Tip 5: You may want to wait until after your day at the track to wash the car because much of the parking available is on dirt lots, grass or gravel. The Preferred Parking near Oklahoma Track is the only asphalt lot. Tip 6: The further away you are willing to park (and who doesn't love a nice walk from the car to the main gates) the easier it usually is to get back on the main roads when racing is done. Handicapped Parking: Accessible parking spaces are available in all NYRA lots. Guests with disabilities can take advantage of designated parking spaces, including those that are van-accessible. To park in these spaces, vehicles must display a current state-issued disability placard or license plate.